Inspiration comes from the most unexpected places sometimes. I was in the office break room the other day waiting for my lunch to finish heating. As I stood there, a man came in with a pouch that looked to have come from Target. He microwaved the pouch for a minute or so and then poured the contents into a bowl. They tumbled out with a puff of steam. 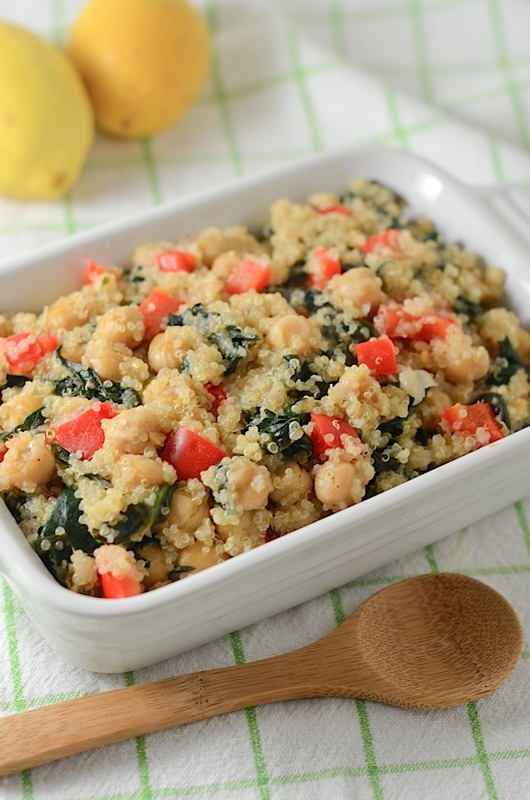 It looked like quinoa, chickpeas, red bell pepper, and spinach. And it looked good. Since I’m not a fan of processed food, I immediately started thinking of how I could create a similar concoction with whole foods. It wasn’t until a couple weeks later that I had time to play with the idea, but the result was a success. 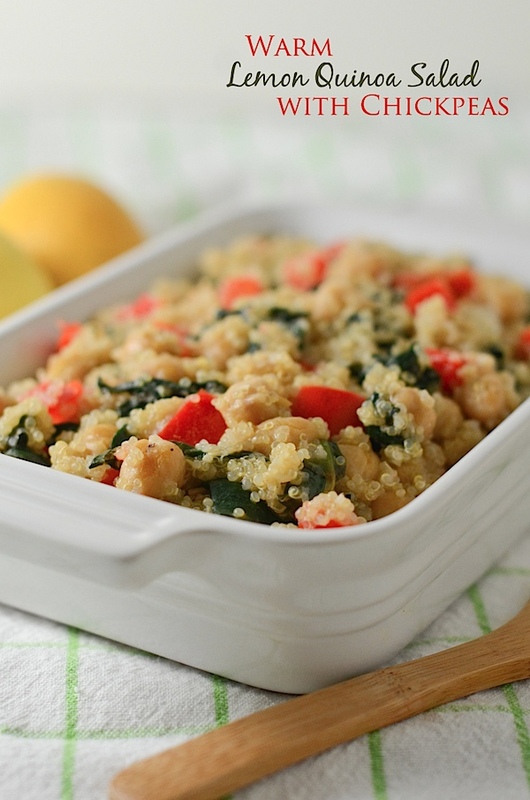 I made Warm Lemon Quinoa Salad (with chickpeas, red bell pepper, and spinach). I love the versatility of this recipe. 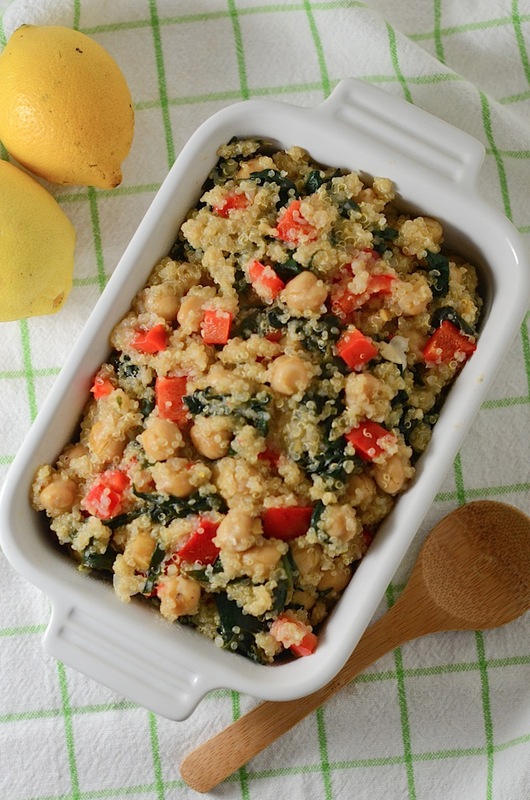 You can serve it as a fun side dish or protein-packed vegan/vegetarian entrée. Quinoa is perhaps one of the most perfect non-animal sources of protein on the planet. What makes quinoa (pronounce keen-wah) unique is that it is the only plant based source of complete protein. “Complete” means that it contains all 9 of the essential amino acids that are crucial to human function and health. As I was working on this recipe, I wasn’t sure how to season the quinoa at first. When I originally saw the packaged quinoa dish at work, I could only capture the ingredients with my eyes. I only saw the major components. But, lemon turned out to be a good choice. I think it really brightens up the flavor. And, the lemon also makes this a great dish for the upcoming spring season. Potlucks, anyone? I enjoyed this Warm Lemon Quinoa Salad with a slice of broccoli cheddar quiche with a whole wheat crust. 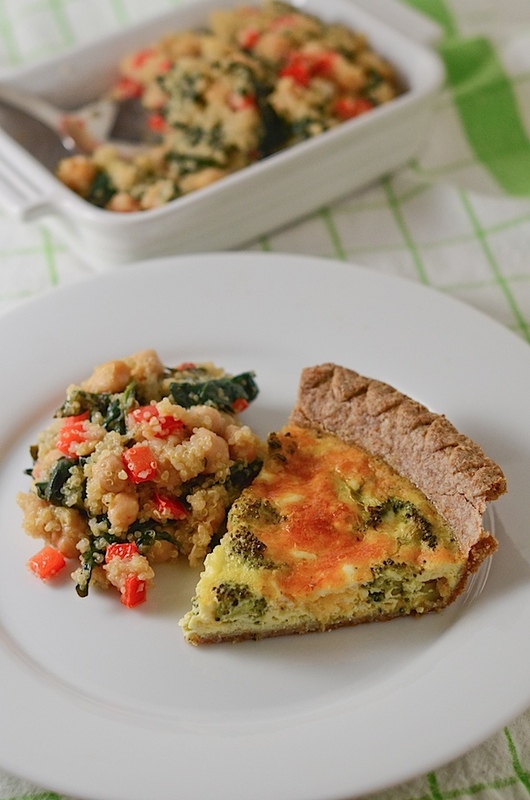 The recipe for the quiche (and another flavor!) is queued up for another day. Feel free to switch up the mixing to our liking. This recipe is pretty versatile. 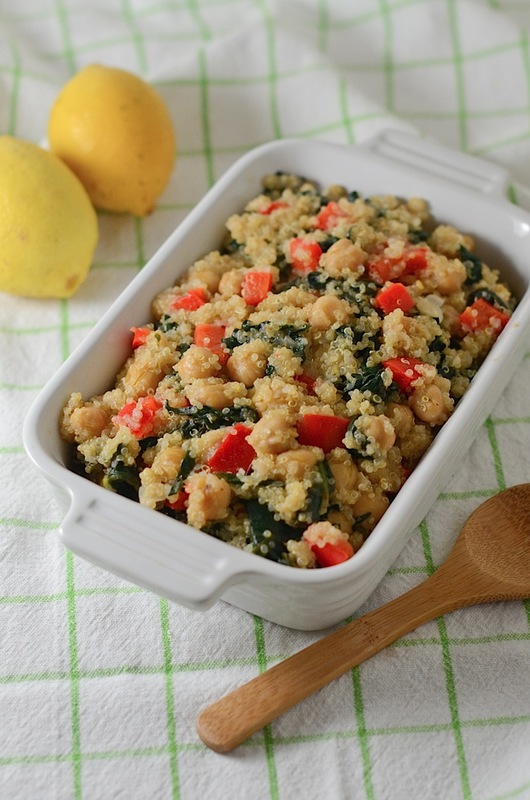 This recipe makes for a great protein-packed vegan/vegetarian entrée or everyday side dish. Consider even trying it for breakfast. Top it with a fried egg! And, freshest is always best, but this dish also reheats well for easy leftover eats. Heat 1 tablespoon oil in a large sauté pan over medium heat. Add chickpeas and spread to an even layer. Cook for 3-4 minutes, until lightly browned. Stir and repeat. Move to a bowl. If needed, add a little extra olive oil (about 1/2 tablespoon). Add the bell peppers and cook for about 2 minutes, until just softening. Add spinach and 1 tablespoon water and cover with a lid to steam for 1 minute. Remove lid, stir and cook till wilted, about 2-3 minutes. Add quinoa, chickpeas, lemon juice, lemon zest, garlic salt, and pepper. Stir to combine. Taste test and season with additional garlic salt, salt, and/or pepper, as desired. Serve and enjoy! Serving size will depend on whether you serve this as an entrée or side dish. If you like this recipe, let me know by sharing this recipe using one of the share buttons below or leaving a comment. I love hearing from you! And, your feedback lets me know what kinds of recipes/posts to do in the future! I adore recipes like this! Diana, thanks for sharing this – it sounds so tasty! I am looking forward to trying it. In your opinion, where is the best place to buy quinoa in Charlotte? Diana I soooo thought this was you then thought maybe it was a close resemblance. then I googled her and realized it actually is you!!!!!!. but just wanted to give you a heads up. not sure if anyone else will be using this pic. Oh my goodness!!!!! I emailed Sandra to ask her to take down the photo. Thank you so much for telling me! Your quinoa salad looks great! Thanks for the shout-out for my casserole too, always appreciated.